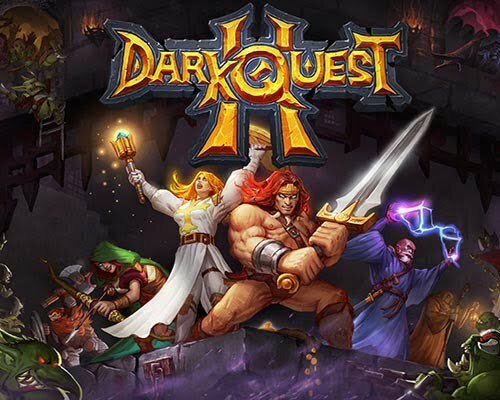 Dark Quest 2 is a Strategy, Adventure and RPG game for PC published by Brain Seal Ltd in 2016. The dungeons are full of dangerous enemies. Can you act as a real hero to defeat all of the enemies in those areas? It’s not that much easy to handle all of them without dying! This game is a turn based RPG inspired by legendary board game Hero Quest. The game features a party based system where you control a group of heroes, an isometric hand-drawn art style, dice based mechanics and much more. Each map is designed to take you through an adventure that will test your party’s strength, courage and sanity as you go deeper and deeper into the castle in search for the chambers of the evil sorcerer. Play a story driven campaign that takes you through a series of adventure on your epic quest to defeat the evil sorcerer. Create new adventures and distribute them in steamworks to play with your friends and share them with the community. Play together with your friends and go on epic adventures! Play skirmish maps, battle in the arena or complete the campaign cooperatively!Every turn each of your heroes in your party can take one single action that will determine the outcome. Play wise and carefully or be forever captive in the eternal prison of the sorcerer. In the darkest dungeons of the castle, when left with no hope your last and only way out will be to roll the skull of fate and reveal your twisted fate.Control a group of 3 heroes each with their own personality and strengths. Use their skills in the appropriate situations and see victories. Use the unique strengths of each character and work together to defeat the minions of the evil sorcerer. Explore twisted mazes, find hidden doors and fight bloodthirsty orcs! Take recipes and components you find in the dungeons back to the blacksmith to forge powerful weapons that will aid you in your quest! Stay with the old masters and learn new powers and tricks that improve the capabilities of each of your heroes. 3 Comments ON " Dark Quest 2 PC Game Free Download "
How do I publish new games? Its pink, the whole screen is pink what have you done to this game? Not only this one but 60% of the games ive got here have the same issue.